Windfinder's wind reports can be viewed on a handy Google Maps mashup. 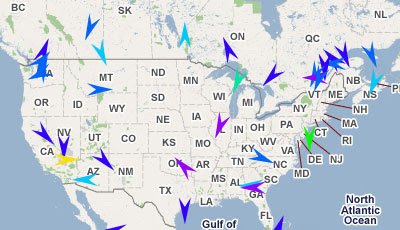 The wind strength is shown on the map by arrows that indicate the current wind direction and wind speed. The arrows are colour-coded to reflect the wind's strength. The wind reports come from data provided by more that 2,800 weather stations worldwide. Users can link to any wind report view using the "Get Link" function in the top left corner of the map. Windfinder also provide a Firefox extension, widgets and gadgets for the most popular platforms, a blog and also Twitter updates.